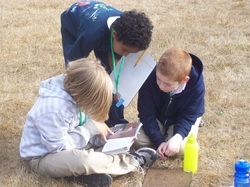 The Outdoor Learning Center (OLC) is a place where our students can explore their world in an engaging situation, explain and elaborate their findings, and evaluate their impact on the earth. Students will apply their learning to age-appropriate service learning projects. Some of the elements we would like to feature in our OLC are: a rain garden, vegetable gardens, a common gathering place, the removal of invasive species, a Nature Mapping study, an authentic place for field experiments, and the development of trails for students and the surrounding community that include interactive species identification signs. The site will provide a permanent site for longitudinal Nature Mapping study, field experiments and engineering projects.